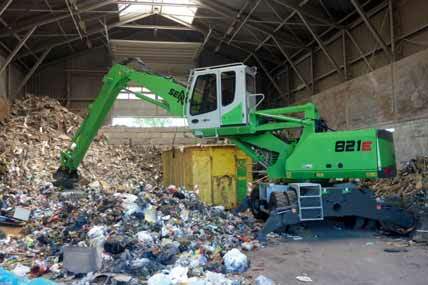 The current SENNEBOGEN 821 E-Series convinces in all recycling and sorting tasks. As an all-rounder the machine covers a broad implementation spectrum with working ranges to 12m and an operating weight of 23.9 tonnes. At the scrapyard or recycling waste, the compact machine reveals its strengths — this is impressively demonstrated by the first customer implementations. In 2013, with the new 821 material handling machine of the current E-Series, SENNEBOGEN presented an all-around machine for scrap handling and recycling. Now the first machines are in demanding use at many customer sites — time for an initial report. As a reliable all-round machine with a powerful 97kW Cummins diesel engine, in accordance with TIER 4i, the SENNEBOGEN 821 is convincing in numerous application areas, from the recycling of waste and raw materials, to sorting and loading activities at the scrapyard. In addition to different equipment lengths, ranging from 9m to 12m, and ULM stick variants, the proven SENNEBOGEN modular system also offers the customer-specific version with mobile and crawler undercarriage or special solutions. As one of the first implementations the machine went to the Netherlands to be thoroughly tested in practical application by several customers. The conditions in the recycling halls could not be more demanding. Household waste and industrial waste is loaded and shredded there. The dust exposure is extremely high. In 24-hour shift operation the 821 is continuously exposed to the highest stresses and it convinces. In test operation diesel consumption of less than 12 litres per hour was determined — an outstanding result. In another application with a load lift magnet, single-digit consumption values were achieved. Moreover, consumption reduction of as much as 20% when operating in ECO Mode could be confirmed — consumption data that pleases every one responsible for machine park management. A high dust burden and the sprinkler system in the hall quickly ensure a stubborn layer of dirt on all surfaces and machine parts. In this application, the fan reversal in particular, turned out to be a crucial quality criterion.Thanks to a short reversal interval and the good fan capacity the cooling ribs remain free of contamination, and this permanently ensures cooling capacity. Possible dust deposits in the engine compartment and on the exhaust pipe could be prevented through the well-designed air conduction. Location change: meanwhile, more than 1,000km away, in Skillingaryd, Sweden, another SENNEBOGEN 821 Mobile is working at the Uniscrap Sverige AB scrapyard, sorting and loading materials of all type. Equipped with a SENNEBOGEN SGM 5-shell gripper, which thanks to the narrow design of the shell, can be immersed particularly effectively in containers. The low deadweight of the grapple has been specially matched to the SENNEBOGEN material handling machines and enables effective use of the working load. Secure grapple closure is ensured even for bulky materials such as auto bodies and long goods. Effective immediately; for this machine class as well, the Maxcab comfort cab offers the operator maximum operating comfort, an excellent overview, and a high level of safety. The elevating cab with sliding door, comfort seat and automated heater/air conditioner automation promise the operator a pleasant work environment. Thanks to the elevated position and with generously dimensioned windows, an ideal overview is always ensured. The new SENNEBOGEN control system, SENCON, supports the operator in daily operation. Idle stop automation and ECO Mode save fuel. In the Optimode of the SENNEBOGEN 821, adjustments can be made for each area of implementation so that the machine can work at the highest level of efficiency. In combination with the optimized engine controller, savings of up to 25% are possible.